Vitra original miniature chair. This amazing and highly detailed miniature is an exact copy of the original large version! The miniature comes in a wooden box with a brochure which provides art-historical information on the background to the design, biography of the designer, and the production history of the respective chair. Miniature Heart-shaped Cone Chair, Designer: Verner Panton, 1958. 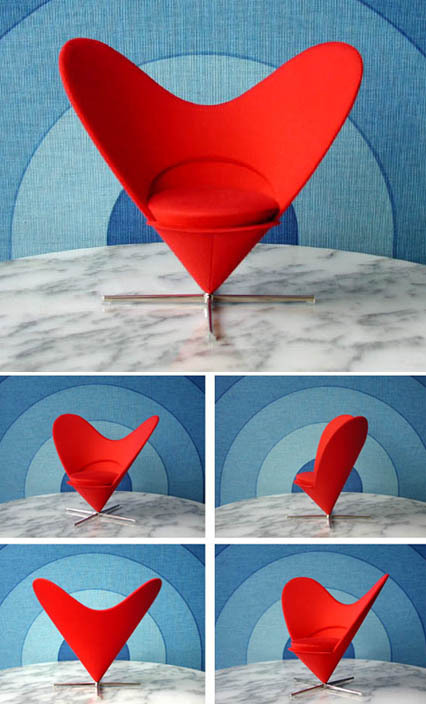 The heart- shaped Cone Chair already points the way to the striking, bright aesthetics of Pop-Art furniture of the 1960s. Its strong colour, non- conformist shape and the highly-exciting balancing act of the shell section on the swivel frame make for the scintillating charisma of the chair even in the miniature. Size: 6.7" x 7.28" x 4.33" (17 x 18.5 x 11 cm). Materials: swivel seat, sheet steel, red cloth.